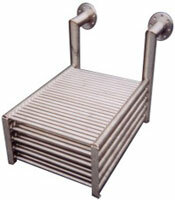 SX-2 coils are efficient and versatile primary surface heat exchangers. SX-2 coil manufacturing process leads to many improvements over generic grid coils! SX-2 coils can be manufactured using many different materials to meet a large range of heat transfer applications. Custom built coils are always available. Please refer to Material Selection Chart for proper material of construction. 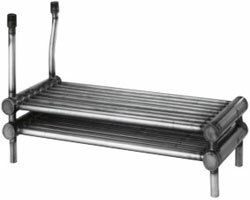 The SX-2 COIL manufacturing process improves the generic gridcoil design. This insures that in-tank solution is always in intimate contact with 100% of the heat transfer surface. No thermal traps which are so common with platecoils, and 100% of the solution in the tank is constantly mixed and working. Highly efficient SERPENTINE- and U-COILS are also available. In order to enhance the heat transfer properties of SX-2 COILS even further, the engineering and manufacturing process includes features to maintain the liquid flow inside the tubes TURBULENT. This feature drastically reduces the thickness of the inside liquid barrier to heat transfer as found in Laminar Liquid Flow. SX-2 COILS are available in many different sizes and shapes and are manufactured using many different materials, all designed to meet a large range of different heat transfer applications. For very special requirements SX-2 COILS are custom manufactured. Whenever you need reliable heat transfer equipment, contact MBA Marketing for immediate response. SX-2 Coil Sizes & Styles - MBA Marketing, Inc. offers three basic coil styles - U-Coils, Serpentine-Coils and Grid-Coils. All designed for maximum performance. They are supplied in various sizes and a large variety of material. Our coil calculator is an easy way of finding the coil you'll need for your job. SX-2 U-Coils are especially suited for heating and cooling application where a limited amount of heat transfer is required and/or where small tanks are involved. 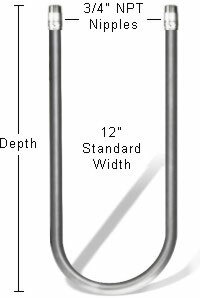 SX-2 U-Coils are supplied in standard lengths, varying from 18" to 60". Other sizes are available upon request. Use the Coil Calculator to determine which coil is right for you. SX-2 Serpentine Coils are especially suited for heating/cooling application where a medium amount of heat transfer is required. These coils can be extremely well adapted to odd sized tanks. SX-2 Serpentine Coils are supplied in three standard designs in variable lengths. Other designs are available upon request. 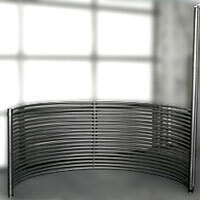 24" 36" 48" 60" 72" 84" 96"
Note: Serpentine coils can be manufactured to reduce the overall height, while maintaining the same surface area. 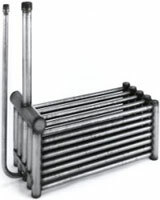 SX-2 Grid coils are the most versatile heating/cooling coils. They are well suited for medium to large amounts of heat transfer. SX-2 Grid coils are supplied in standard designs (with variable lengths) in horizontal or vertical versions. For large heat transfer requirements using steam as a heating medium, the SX-2 coils are also available as Dual Zone Steam Heating Coils. SX-2 Grid coils are available with attached airspargers. Other designs are available upon request. Use the Coil Calculator to determine which coil is right for you. SX-2 Grid Coil Selection Chart - Grid coils are available as horizontal (HT style) or vertical (VT) style. Simply use the VT suffix instead of HT suffix to select a vertical coil from the chart below. 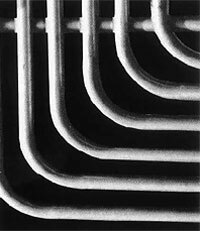 The SX-2 Grid Coil Selection chart provides general guidelines for coils available. Other combinations, number of tubes and/or length of coils are also readily available. 24" 30" 36" 48" 60" 72" 84" 96" 108" 120" 132" 144"
Note: Grid coils feature different designs. 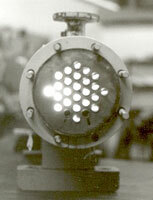 Suited for steam application or liquid flow. 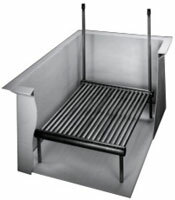 SX-2 Grid coils are also available as Gridcoil/Airsparger units. 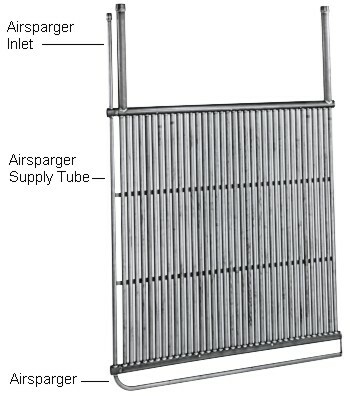 Airsparger can be added to horizontal or vertical SX-2 coils. SX-2 Grid Coil/Airsparger units using heavy wall SS316/L tubes have proven to be a viable alternative to the much more expensive Zirconium tubes or lead coils which have been traditionally used in sulfuric acid anodizing. See Client Testimonial about our Airsparger units! In addition to our line of standard coils, MBA Manufacturing also offers specially designed coils to meet difficult or unusual heat transfer demands. Below are some examples illustrating how MBA Manufacturing engineers can solve problems. Please let us find a solution for your special heat transfer problems!